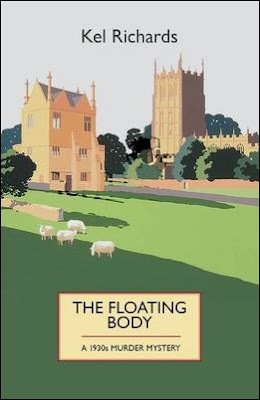 Back in 2016, I reviewed The Floating Body (2015) by Kel Richards, an Australian journalist and broadcaster, who has been writing crime-fiction since the early nineties and his latest undertaking is a series of historical impossible crime novels – casting C.S. 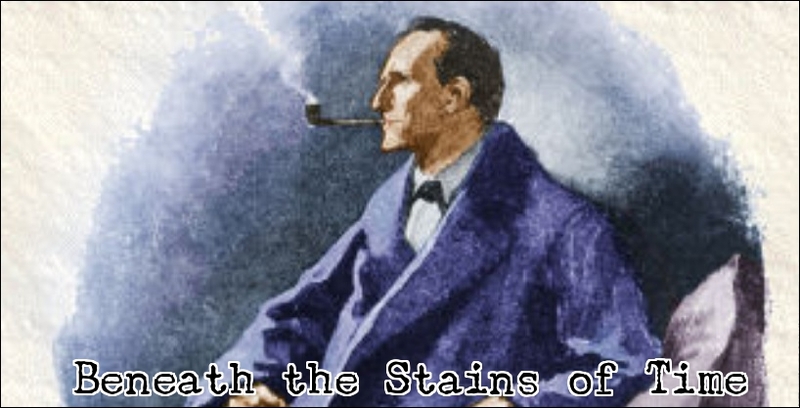 Lewis in the role of both detective and lay theologian. I commented at the time that the book was a bit of a genre-mutt. A mutt who was not entirely devoid of charm, but a mutt nonetheless. Richards attempted to write a book that was a historical novel, a detective story, a reminiscence of public school fiction, a Wodehousean homage and a sermon. Regrettably, the result was less than perfect and an anonymous commentator observed that everything about the book struck him as recycled, "even the cover is a phony," which is hard to argue against as Richards was obviously riffing on his pet writers and hobby-horse subjects (e.g. theology and morality). However, I promised at the end of my review to return to this series for a second serving and, at the time, a fourth book had been announced with a curiously gruesome murder inside a locked room, but, to be upfront about it, it turned out to be more of the same – even if the impossible murder had a novel explanation. But more on that later. 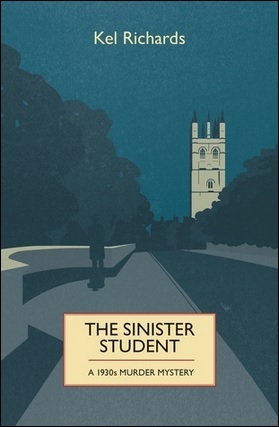 The Sinister Student (2016) is the fourth book in this series and takes place in 1936, among the dreaming spires of Oxford, where the narrator of the series, Tom Morris, returns after a year of absence. Morris is hoping to secure a position as the leader writer at the Oxford Mail, but shortly after his arrival he meets his old mentor, C.S. Lewis, who invites him to a meeting of the Inklings. A real-life literary discussion club that included J.R.R. Tolkien, Hugo Dyson, Rev. Adam Fox and Neville Coghill. All of them make an appearance in this book and Tolkien even becomes a supporting character. 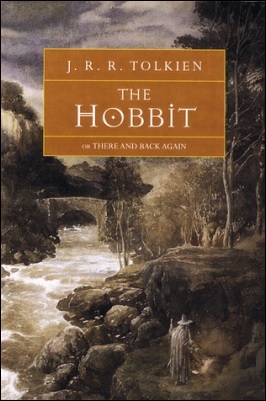 During their meeting, he even reads the latest chapter from a book he has been writing, The Hobbit (1937), which delights all but one person who attended the meeting. The Honorable Aubrey Willesden is a high-handed, unlikable student who, somehow, received an invitation to the meeting, but, to Morris' shock, Willesden is of the opinion that the circle is "vastly overrated" and dismisses Tolkien's story as a mere fairy tale, which has no place in a prestigious university – only in a nursery. Morris can't believe that anyone, who listened to "the vivid storytelling in the classic tradition of the great epics," could have left the meeting unaffected, but he awakes the following morning to something even more unbelievable. A house scout was asked by Willesden to wake him up that morning, to catch a train to London, but he can't rouse him and the solid door to his room was locked from the inside. The door is broken down by two gardeners and they make a gruesome discovery inside the room. Willesden had been "savagely beheaded" and the wound, where his neck had been, had oozed "a great pool of blood across the floor," but the head and murder weapon were miraculously missing from the room! The only door had not only been locked from the inside, but bolted as well and the windows had been securely latched. So there was no way, whatsoever, a murderer could have entered, or left, the room carrying a severed head and a bloodied weapon. However, everything at the scene of the crime suggests that's exactly what happened. A local policeman, Inspector Fleming, failed to find the head and immediately handed over the case to Scotland Yard, which brings Detective Inspector Gideon Crispin and Sergeant Henry Merrivale to the university. Yes, these two characters aren't exactly, what you call, a subtle nod at John Dickson Carr and Edmund Crispin. And they don't do all that much in the story exact dragging a nearby river for the head and murder weapon. There's also a sub-plot running through the story, known as "The Mystery of the Missing Milton," concerning a first edition of John Milton's Paradise Lost (1667), which has gone missing from the Bodleian Library and the last person who had handled it was Lewis – who is (unofficially) suspected of being the book thief. This angers his brother, "Warnie," who's determined to clear his brother's name, but, in my opinion, this plot-thread is merely filler to pad out the story. So this is as good a point as to make up the balance between the good and bad points of the book. I'll start with the bad aspects of the story. First of all, there's the ongoing theological discussion between Lewis (a Christian) and Morris (an atheist), which are hammered, like doorstops, into various points of the narrative and this can be rather awkward as well as annoying. For example, early on in the story Lewis and Morris are looking out of the window, observing the line of policemen combing the school lawn for the missing head, when the former says "ah, yes" we "were talking about the way in which people die" and "the reason why people die." And they simply resume their discussion about the sacrifice of Jesus Christ and the cross. This stop-and-go discussion littered the pages from beginning to end. In my opinion, the book, or rather the whole series, would have been better served had Richards contained these theological discussions to a single (long-ish) chapter, somewhere, in the middle of a book – like a locked room sermon. Unfortunately, I don't believe Richards is really interested in writing strong Christian-themed mystery novels. Obviously, he likes the classic detective stories and the locked room mystery, but my impression is that he sees them as a pulpit to preach from and this comes at the expense of the plot. And that's, in my book, an unpardonable sin. A second sin is that the story, as a whole, is pretty dull and nothing of interest really happens until the end, which is quite an accomplish for a detective story about a brutal decapitation inside a locked and bolted room. The murderer, along with the motive, is even presented to the reader on a silver platter and then gets ignored by everyone until the final chapters. This is not what a good detective story should be like! Lastly, I really began to dislike Morris over the course of this book, who comes across here as a weak-kneed pushover, which is exemplified in how he's used by a potential love-interest, the haughty Penelope Robertson-Smyth, who treats him with a complete lack of respect – like he's nothing more than a piece of modeling clay who might be molded in something remotely desirable. It's not until the end, when she tells him she never wants to see him again, that he finally pulls himself up by his own spine and whimpers, "I'm over her now." Morris also never provides any real opposition to Lewis, who lectures him like a child. Luckily, the book was not entirely bad and had some positive aspects. One of these aspects is that story, like its predecessor, had a good amount of charm and was very readable, but also appreciated the cryptic clue Lewis gave to Morris. Lewis told him that, over the years, some of his students have been adroit and some have been sinister. Statistically, "most have been adroit" and "only a minority sinister." Morris was an adroit student and Willesden was a sinister student. Although, I think Richards should have used the word dexterous, instead of adroit, this clue was neatly tied to the solution of the locked room murder. A pretty good locked room trick, all things considered, that deserved a better treatment. One that would have used the arterial gushing of the neck wound as a clue. The spurt of blood, after the head came off, would have literally pointed in the direction of the (locked room) solution, but here I go nitpicking again. So let me tell you about the one thing I, as a purist, should have hated, but ended up loving it. There's a foreign student at the university, David Bracken, who has an old-fashioned wardrobe in his room, but this wardrobe has a special quality that transported the book to the border-region where genres meet. Admittedly, this element is completely out-of-place in historical mystery novels, but this part was surprisingly well-handled and loved the reason why Bracken was present there. Not everyone is going to like it, but I was pleasantly surprised by it. On a whole, The Sinister Student wasn't an unpleasant read, but neither was it a very exciting one and the overall plot was, in spite of a relatively good locked room trick, mediocre at best. And this can be solely blamed on the author who preferred proselytizing over plotting. The storytelling and characters have their charm, sure, but this is not enough for readers to whom plot is the most important feature of a detective novel. I'm not entirely sure whether I'll be taking a crack at the other titles in this series, The Country House Murders (2015) and The Corpse in the Cellar (2015), which are impossible crime novels, but everything suggests they suffer from the same weaknesses as The Floating Body and The Sinister Student. So, if I take another look at this locked room series, it won't be for another year or two. So far this overlong, drag of a review and I'll try to grab something good from the pile for the next time. I did wonder if I had been missing out by not continuing to read books 3 and 4 in this series, but it seems not. I like the Lewis premise/theme of the book, but feel it never gets properly executed. Equally I found the mysteries to solve in the first two books very easy to fathom, which is saying something. In fact I knew who committed the murder in the second book right after the murder has happened! I'm afraid this one is more of the same and the murderer is here practically handed to the reader on a silver platter. I begin to suspect The Sinister Student is actually the end of this series, because nearly two years have passed and a new title hasn't been announced. And how the wardrobe business worked out could be read as a series closer. So at the very least the series was consistent in its quality. Given what I think the wardrobe is alluding to, it is annoyingly tantalising, as it reminds me of a trilogy I read which may have similar type ending. I have this, as I thought I'd skip ahead to a later one given the problems that seem to present in the earlier books. Whether I should be surprised that they seem to present here or not will be a subject for some debate, but I'm still interested to see what I make of this when I read it (we do, after all, have a history of not always agreeing...). "we do, after all, have a history of not always agreeing..."
Your conclusion should not have surprised anyone. The first problem with this book is the date it was written. Exactly who in the modern world is interested in writing a good detective novel? When you complain that the author preaches, who is it now who does not preach? I agree that the state of contemporary crime fiction is abysmal at best, however, there are still writers today who write actual detective stories. Several of them have been discussed on this blog: Bill Pronzini, Paul Halter, William DeAndrea, Paul Doherty, M.P.O. Books, Herbert Resnicow, Edward D. Hoch and John Sladek. And don't forget about the Asian neo-orthodox mystery writers like Soji Shimada, Alice Arisugawa, Yukito Ayatsuji, Szu-Yen Lin and Gosho Aoyama. They're thinly spread around, but they're there. Most of the American writers to which you refer are dead, retired, or past their best work. You were referring to detective stories in the modern world and, for me, that's everything written after the 1950s. But if you're talking about the 2000s that you have a point. As older writers retire or pass away, you'll find that good, old-fashioned detective stories are now mostly being written by writers from non-English speaking countries. On the bright side, we're now in a Renaissance Era with all the classics and long-lost gems getting reprinted and rediscovered. So the next step, hopefully, is a neo-classic period like the one going on at the moment in Asia.